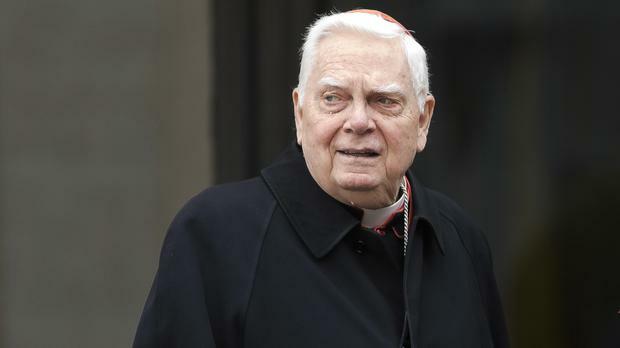 Cardinal Bernard Law, the disgraced former archbishop of Boston, has died at the age of 86, an official with the Catholic Church said. He had recently been hospitalised in Rome after falling ill.
Law was once one of the most important leaders in the US church, helping to set priorities for the nation's bishops, and was favoured by Pope John Paul II. But in January 2002, The Boston Globe began a series of reports that used church records to reveal that Law had transferred abusive clergy among parishes for years, without alerting parents or police. Within months, Catholics around the country demanded to know whether their bishops had done the same. Law tried to manage the mushrooming scandal in his own archdiocese by first refusing to comment, then apologising and promising reform. But thousands more church records were released describing new cases of how Law and others expressed more care for accused priests than for victims. Amid a groundswell against the cardinal, including rare public rebukes from some of his own priests, Law asked to resign and the pope said yes. "It is my fervent prayer that this action may help the archdiocese of Boston to experience the healing, reconciliation and unity which are so desperately needed," Law said when he stepped down as head of the Boston archdiocese in December of that year. It was a stunning fall from grace for Law and a rare step for the church, which deeply resists public pressure but could no longer do so given the scope of the crisis. Since 1950, more than 6,500, or about 6% of US priests, have been accused of molesting children, and the American church has paid more than 3 billion US dollars (£2.3billion) in settlements to victims, according to studies commissioned by the US bishops and media reports. Law still retained some support in the Vatican. In 2004, he was appointed archpriest of the Basilica of St Mary Major, one of four principal basilicas in Rome. When John Paul died the next year, Law was among bishops who presided at a memorial Mass for the pontiff in St Peter's Basilica. Law also continued for several years to serve in Vatican dicasteries, or policy-making committees, including the Congregation for Bishops, which recommends appointments to the pope. Advocates for victims saw the posts as a sign of favour for Law by church officials unrepentant about abused children. In the notorious case that started the 2002 crisis, as recounted in the film Spotlight, the Globe reported that Law and two of his predecessors as Boston archbishop had transferred former priest John Geoghan among parish assignments despite knowing he molested children. More than 130 people eventually came forward to say Geoghan abused them. The archdiocese paid 10 million US dollars (£7.5million) in settlements with 86 of his victims and their relatives as Law was clinging to his job. It was nowhere near enough to ease the growing anger. As he announced he would leave, Law asked Boston Catholics: "Please keep me in your prayers."